I’m not one for slavishly following in the footsteps of ‘The Great Planthunters’. I can quite happily leave that to people who can’t think of anything original to do. Having said that, there are some very interesting parts of the world to visit that happen to have been looked over somewhat by one or two famous types. One of these places is Manipur, NE India and the celebrated Frank Kingdon-Ward spent some time there in 1946 and 1948 and wrote a book about it titled, rather appropriately, ‘Planthunting in Manipur’. So, rather than let that put my traveling companion Paul Barney and I off, we decided a botanising trip to this infrequently visited, remote corner of India was in order. Paul had done a brief reccy in Jan ’12 whilst visiting his wife’s family in Mizoram and had made contact with one or two people on the ground in Manipur, which made organising trips into the hinterland a relative doddle. Local Meitei (Manipuri) ladies rustling up some lunch for us in the market in Imphal, capital of Manipur. The scorchingly hot Naga, or King, chili, on sale in Imphal market. For one interested in temperate flora, it is important at this latitude to aim for altitude. There are a few peaks over 2500m asl in Manipur, with a concentration of generally high ground in Ukhrul District, home of the Tangkhul people, a Naga tribe. These peaks head right up to the Burmese border, though accessing the more remote is no mean feat. So, flying from Heathrow via Dubai, Kolkata, Aizawl in Mizoram and finally Imphal, the capital of Manipur, we found ourselves in Ukhrul, the ridge top District Headquarters, in November 2012. Imphal lies in the moist flat plains, mostly under cultivation for rice, at 786m asl, but Ukhrul to the NE, though not exactly alpine at nearly 1900m asl, enjoys a more temperate climate. The land is folded north-south (ish) into multiple ridges and valleys throughout the whole region, forming picturesque mountain scenery and Ukhrul straddles one of these ridgetops, commanding fine views in all directions. Kingdon-Ward rented a cottage here in 1946 as a base for his excursions. The gateway to Ukhrul. Seemingly a metal interpretation of the traditional timber adornment to important buildings in Naga villages. The old head man’s house in Hungpung village, Ukhrul, with Sirhoi in the distance. ‘Spirit Trees’ outside the Head man’s house, Hungpung. A feature only occasionally encountered now, but pictured in Kingdon-Ward’s book. Traditional dress is still used by the female folk, especially at weekends and definitely for celebrations. There are a number of patterns and colour combos, but most include scarlet. Our first destination was Sirhoi Kashong, almost the highest mountain in the Eastern hills of Manipur at 2568m asl. Sirhoi lies within spitting distance of Ukhrul, if one is exceptionally good at spitting, making for easy excursions from the town. Vegetation on the lower slopes is typical of much of the hill country of Manipur, but as one gets above roughly 2100m asl the greenery gains a far more Himalayan element. Kingdon-Ward had this down as Sorbus vestita, but is more likely either S. paniculata or S. kohimensis. This was coming into leaf and just past peak flowering in November! Pleione praecox. An autumn flowering species, plentiful as an epiphyte on the lower to mid elevation slopes of Sirhoi. The south facing mid to high elevation slopes of Sirhoi are burnt annually to maintain open grassland. An attractive little Asparagus was found in woodland, Sirhoi. Magnolia doltsopa, high on Sirhoi. The lovely ferrugineous flower buds of Magnolia doltsopa, Sirhoi. Long known in cultivation as Sorbus insignis, under Kingdon-Wards collection number KW 7746, his gathering from Japvo, Nagaland never quite fitted that species, though was obviously very closely related, as it is also to S. harrowiana. The name Sorbus keenanii has only very recently been assigned to this taxon by the planthunter and botanist Keith Rushforth. Named after the British botanist Jim Keenan, who also collected the same species in N. Burma in 1962, S. keenanii has more numerous, smaller leaflets than S. insignis with smaller more numerous fruits and differs in bud details. Kingdon-Ward also found it on Sirhoi of course, as it is fairly conspicuous on the upper reaches of the mountain, where a few specimens attain most un-Sorbus-like proportions. We found a tree (almost certainly the huge specimen K-W refers to in his book) with a crown equal in size to the big Quercus lamellosa sharing the same forest. Sorbus keenanii, conspicuous in autumn colour in the mainly evergreen broadleaved forest high on Sirhoi. The oak relative Lithocarpus pachyphyllus is common over a wide area, from Bhutan in the Himalaya eastwards into China. They make potentially very large bulky trees. Their huge fruit clusters are a common sight on the forest floor in autumn. Oleandra undulata, an epiphytic deciduous fern, forms vigorously spreading colonies on vertical or horizontal trunks and branches, showing in November one of the only signs of autumn, as it turns yellowy-orange-brown. Oleandra undulata on a Lithocarpus. At higher elevations in Manipur the splendid Quercus lamellosa is one of the dominant canopy trees. With huge evergreen leaves, white glaucous beneath and vast golden velvet acorns, it is without doubt one of the noblest of all oaks. Quercus lamellosa acorn. A Cyclobalanopsis oak, shown clearly by the concentric rings replacing scales on the acorn cup. Quercus lamellosa leaves are usually up to 30cm long, or even larger like these 35cm examples on vigorous, sheltered young trees. An old, relatively exposed Quercus lamellosa. Sirhoi and surrounding peaks, showing the managed grassland. Heading back after our first day on the mountain. It should be mentioned at this point that the famed Manipur Lily, Lilium mackliniae, was originally discovered in this very same grassland by Frank Kingdon-Ward, back in 1946. It was named after his wife, originally Jean Macklin. Still thought by many, especially locals, to be only known from this one spot, it is in fact a fairly widespread species, being found on various high peaks in Manipur and also Nagaland to the north. There is no reason why it shouldn’t be found just over the border to the east in Burma. November isn’t, of course, the best time to see the Manipur lily in habitat, but we found the occasional dried up seed capsule here and there. Dried capsule of Lilium mackliniae, barely visible in the autumn grassland. 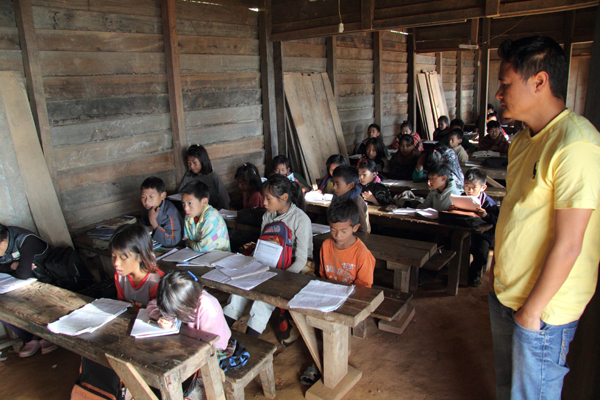 So, for our second day in Ukhrul District we headed straight back to Sirhoi for further study. Quercus griffithii, a fairly common oak at mid elevations in Manipur. We found this one near the base of Sirhoi. Schefflera shweliensis made occasional woodland trees here to about 12m high. Mahonia manipurensis is endemic to the State. Magnolia campbellii, only found in Manipur at the highest altitudes, had most interesting and distinct virtually orbicular leaves (not clearly seen in this photo due to natural folding). The view west from Sirhoi Kashong peak. One of the highest points in Manipur. Paul stands below doing his, admittedly highly convincing, albatross impression. Back down amongst the good folk of Manipur one finds a fairly horticulturally aware society. Some rather special plants, often gathered from the wild locally, can be found gracing the gardens of the Tangkhul people. Trachycarpus ukhrulensis is a very recently described palm and is found in one or two gardens here and there. Kingdon-Ward mentions seeing this species in his book, but that was on the border with Burma, some miles to the east, and he merely passed them off as Chamaerops excelsa, an old name for what we now call Trachycarpus fortunei. There are minor, but distinct botanical differences between T. ukhrulensis and T. fortunei, but to a gardener a more poignant fact is that it is simply a much better looking palm. The foliage, with numerous segments, is rigidly held, all coated with a layer of white powder beneath. Some argue that it is actually not a distinct species at all, being in reality a western population of the Thai T. oreophilus, but until that is resolved I shall call it T. ukhrulensis. The Tangkhul often attach wild gathered epiphytic orchids to trees or dead tree trunks in their gardens. Here we see a few, including the sumptuous Vanda caerulea, adorning a large Schefflera hypoleuca. The large leaved Schefflera in the photos above was fairly common at mid elevations (this one being used as a garden tree) and went through a handsome juvenile stage, as seen below. There were at least 4 Schefflera species in the area and also other evergreen, woody Araliaceae like Brassaiopsis. An unidentified, highly attractive, smaller leaved species of Schefflera was also seen on more than one occasion at mid elevation. Brassaiopsis hainla. Related to Schefflera, Fatsia etc., these make handsome evergreen shrubs or even small trees with bold foliage. Brassaiopsis hainla, showing the spiny stems. Engelhardtia spicata, a walnut relative, was often seen at mid elevations making a handsome pinnate-leaved tree, in fresh new leaf in November! The embryonic fruit clusters, ripening in spring, show the relationship with Pterocarya. Prunus cerasoides. Another tree doing a good impression of spring in autumn. This was a fairly common sight at the edge of woodland at mid-elevation. Citrus medica was found in a few gardens. This made trees to about 6m with large rounded, knobbly, very thick skinned fruit. Paul gets to grips with an interesting looking Hedychium, almost definitely H. coccineum. The North East has the greatest Hedychium species diversity in India and we saw at least 6 species. It also had this rather attractive pale central band to each leaf. Cymbidium iridioides in an Ukhrul garden. Further study on nearby mountains beckoned. As is always the case, many things that were no doubt hiding on Sirhoi started to show their faces, allowing us to build a much better picture of the general local flora. Luculia gratissima, scenting the air around. Luculia is a deliciously sweet scented shrub, found commonly as a weed, especially in disturbed areas. The flowers are the size and shape of a large jasmine. The potentially large and impressive Mahonia magnifica, endemic to Manipur. This would appear to be a slim leaved form of Camellia kissi. Kingdon-Ward mentioned finding Cornus capitata in the local environs and we were expecting to see it at some stage. However, the moment I saw the tree below I realised the old man had been incorrect in his identification. Yes, it is closely related to C. capitata, but it differs on some key characteristics. The leaves are virtually without hair, more like C. hongkongensis, and the fruit are huge, up to 6cm across and drop to the ground green. This is a very interesting find indeed and deserves further investigation. Cornus sp. Old trees reached about 10m here and like most old trees in the area, were festooned in epiphytes. Cornus sp. fruit. Green when ripe and up to 6cm across! Huge green fruits (for a Cornus) drop green to the forest floor. The end of another day’s good botanising. At this point we had been considering attempting a trip up north into Nagaland to climb Mt. Saramati, smack on the Burmese border and standing at 3826m asl, but it seemed we probably wouldn’t sensibly have enough time. So, what to do next? Head out west from Ukhrul and explore some of the higher peaks, or do exactly the same in the opposite direction up to the Burmese border? The latter seemed like it would perhaps be considerably more difficult, due to the lack of paved roads, but Kingdon-Ward had described in some detail an expedition he had made in that direction, albeit on foot, in search of wild tea, Camellia sinensis. He got to the end of the bridle path, as it was then, as far as a village called Khayang and then climbed the mountain above the village; a peak he called Hkayam Bum, which stands at a very reasonable 2833m asl, making it the second highest peak in Manipur. We were informed its name was now Khayangphung, though I have also seen it written Khayangbung. The Burmese use Bum for many a mountain, so it no doubt means exactly that: Khayang Mountain. After a few words in the right ears it seemed we would be able to do the same, by way of a man with an old Mahindra Jeep that ran the route reasonably regularly, or at least when there were passengers. The road was only passable, a few miles beyond Ukhrul, by this type of vehicle (basically an Indian take on the Willys Jeep) and then only in the dry season. Even then it would take 8 or more hours to get there over this God forsaken track, with the distance between Ukhrul and Khayang being just 18 miles as the crow flies. But what the hell, it sounded like fun, or something akin to it, so first thing the next morning we joined four or five others (including the head man’s son from Khayang) plus the driver and squeezed ourselves in. There was much initial interest as to why we wanted to go. We were told we were the first Westerners ever to travel to Khayang, but we informed them straight away that Kingdon-Ward, his wife and entourage had been this way before, albeit 64 years previously. Vast exposed honeycombs up to about 1m across, plastered to a rock face, en route to Khayang. Away from the heavily deforested areas lush vegetation accompanied us along much of the route, especially in moist hollows and streamside spots. Virtually the entire journey was spent at a fairly low altitude as we skirted the mountain flanks, around perhaps 1600m asl, and the vegetation was accordingly subtropical in nature. Amorphophallus sp. having stern words with Paul, en route to Khayang. A lone hunter with a good lunch pack. Begonia sp. aff. palmata. This was common along certain stretches of our route on shady road banks. It was highly variable in leaf colouring, with as many brightly variegated with white markings as had plain green leaves like this one. The most variegated resembled the plant named ‘Tie Dye’ by Michael Wickendon, collected by him in Arunachal Pradesh. A broad leaved Curculigo shared the same habitat as the Begonia. This large leaved Begonia is perhaps B. longialata, though Begonias from this part of the world are poorly understood due to a dearth of field work, making positive identification difficult. This beautiful Begonia was far less common, seen only along a short section of the track. It has very recently been described as a new species (2018 Camfield and Hughes) and been given the name B. koelzii, six years after we found it here, though it was found originally by Clarke in 1885, then also by Kingdon Ward in 1949 and Koelz in 1950. It is closely related to B. panchtharensis from Nepal, though this Manipuri plant has very obvious bulbils, or tuberlets, at the junction of petiole and leaf blade plus other differences. These photographs were used in the official description of the species by Rebecca Camfield, RBGE. Begonia koelzii, en route to Khayang. Begonia koelzii, showing bulbil, en route to Khayang. Whilst at a quick pee stop I looked up to see we had parked under an arachnaphobe’s nightmare. This multi-storey web was literally metres across, covering the entire track and contained various large spiders. Each one no doubt with enough venom to wipe out a garrison of the Assam Rifles. A web of some proportions. After a full day’s travel, with a few 5 minute breaks here and there, we arrived at Khayang at dusk. A few folk wanted to come and see a white guy in the flesh for the first time, including some old guys in their 70’s, except they had seen a white guy before; they remembered Kingdon-Ward coming in 1948. They even pointed out the house, or the site of the original house where he stayed and talked of the large entourage he brought with him. Everyone was extremely courteous, friendly and genuinely welcoming. The next morning we met up with the village elders again and photographed them in their (partly) traditional dress. We then got ourselves a guided tour of the village. 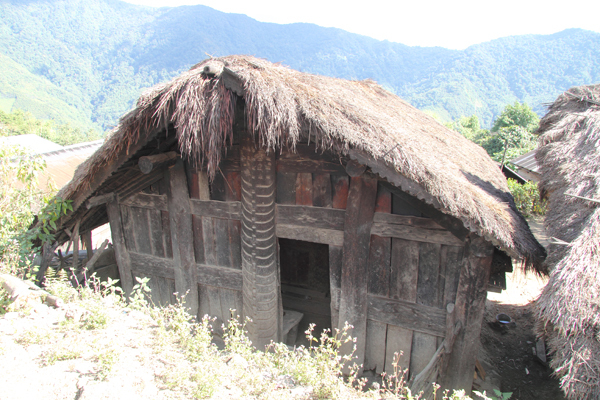 One of the more traditional Khayang houses. A traditional wooden water trough. Khayang schoolhouse and Caryota maxima ‘Himalaya’. Khayangphung looms large behind. Kids of all ages shared the same room, each speaking aloud the particular work they were individually learning, making for a cacophony of sound audible some 100 metres away. Caryota obtusa (or C. gigas) to the left with C. maxima ‘Himalaya’ to the right. Khayang village. In the photo above the palm to the left is perhaps Caryota obtusa or C. gigas; apparently there are two very large growing Caryota in NE India. This was seen wild in the shadier gullies below the village, mainly as an under-storey tree. The slimmer palms to the right are probably the plant that goes by the name of C. maxima ‘Himalaya’. As you may have gathered, Caryota is, in part, a poorly understood genus taxonomically. Khayang village. Caryota obtusa (or C. gigas). Our plan was to reach the peak of Khayangphung and return to the village in three days, spending two nights on the mountain. There was no time to lose, so after a hearty breakfast we set off with a posse of hunters, the head man’s son and a few other friends and relatives. The hunters would be our invaluable guides, camp builders and suppliers of fresh meat for meals. An Otochilus orchid on a fallen log in the forest on the lower slopes of Khayangphung. The epiphytic orchid Eria vittata on a fallen trunk in the forest. Before very long we were in pure virgin forest, where huge trees surrounded us most of the time. As wonderful as that is, it is often very difficult to identify them when you can’t reach any foliage or fruit. A forest giant, perhaps Lithocarpus pachyphyllus. Huge exposed root-plates were a common site on these giants as they grew on often very steep slopes. We only saw one colony of this Antrophyum sp., a very distinctive epiphytic fern. Cardiocrinum giganteum was only found in this one streamside location at about 2000m asl. Plants only reached 2m tall, more like the usual height for the var. yunnanensis. The species is very variable with a wide distribution and it would be fascinating to observe these plants in flower. After a strenuous full day’s ascent we dropped into a valley at roughly 200m asl to make camp for the night. It was at this point we found that our guides had not planned to erect rain shelters. “What if it rains?” was met with a shrug and a smile. It had rained quite hard the previous night back in the village, so we felt slightly perturbed, but not altogether distraught. The hunters were building a series of fires that were placed between every two sleeping positions on the ground; we would at least be warm, or in my case at least, so it turned out, hot. Our hunting chums returned with more. This time a Leopard cat, Prionailurus bengalensis bengalensis. I was rather glad when they kept that one for their own personal consumption. I suppose I have eaten rat and dog, so cat wouldn’t be so very terrible, but initially we were rather alarmed; mainly because of fears for the species long term survival in the area. They may still be common; the forests here are very extensive and seemingly in an almost pure state, though how much game is hunted is anyone’s guess. Prionailurus bengalensis bengalensis, the Leopard Cat. A very variable species with a huge range in the wild. Listed as ‘Least Concern’ by the IUCN, but ‘threatened by habitat loss and hunting in parts of its range’. Don’t we know it? 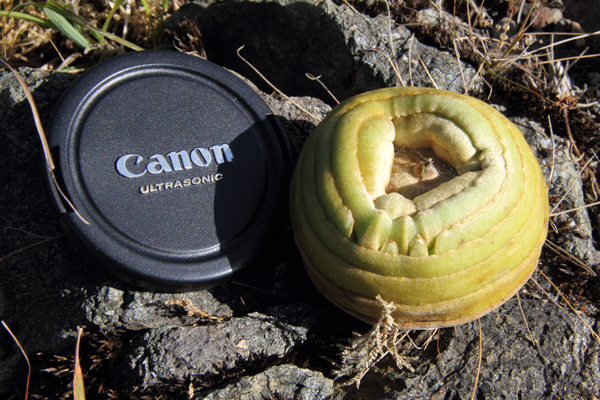 What I believe to be Citrus hystrix grew around the camp. Cymbidium cyperifolium was a common ground orchid above camp 1. As we reached about 2500m asl, Sorbus keenanii could be seen in full autumn glory above our heads. It often grew as an epiphyte in the crowns of large evergreens such as Quercus lamellosa and Lithocarpus pachyphyllus. The fern Plagiogyria glauca suddenly became common at just under 2800m asl. It is a handsome evergreen species with glaucous undersides to the fronds. Plagiogyria glauca is closely related to Blechnum and has separate fertile fronds. At about 2800m we reached a saddle which would be camp 2. It was windier and obviously cooler up here. After a brief time looking around we carried on up to the summit just a little higher, but far more exposed. Schefflera shweliensis, standing about 15m high at top camp, 2800m asl. We had assumed this to be S. rhododendrifolia at the time, but the inflorescences differ. One of our chums was sent up quick smart to collect a specimen. Members of the party on the summit of Khayangphung, enjoying the fruits of two days hard slog; superb views in all directions over miles of untouched virgin forest. From the summit all views east and north are into Burma, in fact according to Google Earth the border ran through our top camp, so stepping into Burma wasn’t exactly difficult. Most of our party gather for a group shot at the very highest point, 2833m asl. This beautiful Neolitsea species would appear to be N. cuipala and was common around the camp as young specimens. The parents would have been unidentifiable above our heads. This dainty Clematis had a remarkable similarity to C. yunnanensis, though smaller, and is probably C. acuminata. Clematis acuminata? Khayangphung, 2800m asl. This splendid holly, Ilex sikkimensis, made a tree to about 15m high. Ilex sikkimensis looking distinctly un-holly-like, 2800m asl, Khayangphung. The Himalayan yew, Taxus wallichiana, was common on the ridges at high elevations on the mountain. It was a chilly night, but with something like seven fires between us we were kept warm enough and luckily it didn’t rain. The main problem up here was constant smoke in your eyes due to air movement; the opposite of the previous night in a sheltered valley. The hunters erected a wooden frame above one of the fires to try and reduce the moisture content of the fresh meat they had caught that day, before carrying it back to the village. Females cook and men hunt and cut wood; that’s pretty much the way it works. The kitchen at Top camp, Khayangphung. Semi-smoked and semi-dried venison after about 12 hours over this fire, ready for bagging up to carry back to the village. We ascended to the peak again, passing the only Magnolia campbellii trees seen on the mountain. Like on Sirhoi, they were only to be found in the top-most forest. Three species of Rhododendron were at the peak also, R. maddenii, R. johnstoneanum and another. Rhododendron johnstoneanum, Khayangphung, 2850m asl. A clearer view to the north the next morning, looking straight up the Indian/Burmese border, which basically follows the highest peaks. Looking west with a branch of Sorbus keenanii. The view above shows the tall peak in the distance that Kingdon-Ward reached, a false summit on the Khayanphung massif. He thought he had reached the top and says so in his book, but from his description he clearly went up the wrong lump by following the ridge straight up from the village. He also got there in a day from the village and it is impossible to reach the peak in such a time. Our next objective was to descend the mountain in half the time it took us to get up. This would seem not unreasonable, but with a deep valley to cross, including a steep ascent, it was very tough going. We set off after breakfast and reached Khayang village at dusk. Looking back up the mountain from about 1850m towards Camp 1. Resting in the paddy fields below Khayang village at the end of our descent. Here, again, we had to climb steeply back out of a valley, just when we really didn’t need it. It was all in a day’s work for these guys. Khayang paddy fields. Kingdon-Wards ‘Great Wall of Burma’ in the distance to the south-east. Khayangphung looms large and ominous above. After a solid night’s sleep, the next morning we had a good breakfast with our friends in Khayang and braced ourselves for the journey back to Ukhrul. Rice drying in Zingsui village, en route to Ukhrul. Traditional architecture in Zingsui village. Back in Ukhrul the next day, the weekend brought out some well dressed ladies. From Ukhrul it was just a case of heading back down to Imphal ready for our flight to Kolkata. On arrival in Imphal it turned out there was an international friendly polo tournament that had kicked off the day before. Manipur is apparently the home of polo (note blue sign below) and small teams from the UK, Germany, etc had come to celebrate this fact. We thought we’d better take a look and headed for the grandstand. As we tried to head for some average looking seats we were ushered into a prime spot reserved for wives, girlfriends and hangers-on. We made no complaints, especially when the free food and drink arrived. The rare ‘Manipur pony’ has short legs, but is the traditional beast for polo. Not what many of the players were expecting apparently. Great Posting Nick. Looks like it was a great adventure if not a bit too temperate for my neck of the woods. Fantastic photos. Enjoyed it very much. Hope all is well at Pan Global. Thanks Dan. Hardiness-wise I think on a par with N. Vietnam for eg. Gotta get the alt’. Some things should thrive with you. Your blog’s filled me with excitement, a tantalizing array of mouth-watering plants. Some great pictures of the local people, loving that shot of Rhodo. johnstoneanum toward the end! Nothing wrong with a bit of excitement Jez. Glad you liked it! Fantastic record of what must have been a fascinating trip. Some truely impressive plants – amazing to think you were the first “whites” for 70 years!!! I hope you’ve collected a few seeds!!! Thanks Simon. Twas fascinating indeed! What an awesome trip Nick! Looked at your sleeping bag/campsite and cannot imagine getting any sleep like that. Wish I could be a tough nut like you… what freedom! Hey Nick, I see you’re a pretty adventurous type – looks fantastic! Great part of the world – my Chinese wife thinks some of the locals look East Tibetan. Would love to visit your PGP place sometime. The narrative was so interesting I kept reading to the very end, and was not disappointed. Good to the last entry. Photos were brilliantly chosen – I’m sure you had quite a job deciding. But end result thoroughly enjoyable. Thanks a lot. Thanks for sharing an amazing trip! Looks a lot like N Vietnam! Would love to get over there at some point, but where are the Polygonatum? Surely there were some somewhere? I know kingianum is in Manipur, but not sure what else. Arunachal Pradesh is on my target list right now and NW Yunnan. We did see P. tesselatum on Sirhoi. No photos on my camera at least. That was so beautiful. Great job you had just travelling and exploring places and plants. I’ve come to know the names of the plants in English as I wandering what it was called in years. Can I share some of your photos from Manipur on my Facebook page? Hi Ashang, Glad you enjoyed them, no problem, just credit me as author. 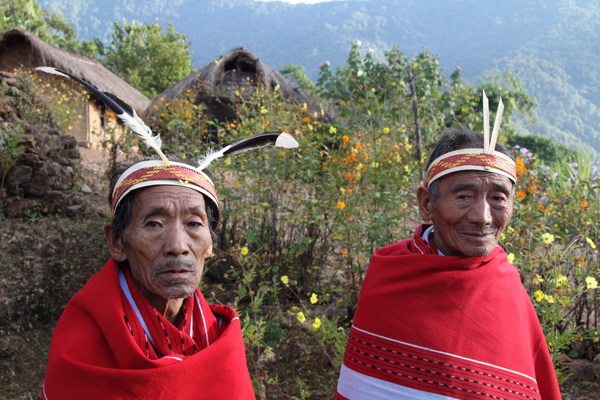 I’ve just returned from another 3 weeks in Manipur and Nagaland. Beautiful country. Hi Nick, it was such a pleasure reading your blog. The photographs are stunning. I am from Manipur myself, I have to thank you for capturing the colors of Manipur so beautifully. If you don’t mind can I use a few of your pictures for my college research? Thanks so much for taking the time to share that amazing expedition. I would love one day to take some time to travel and plant hunt like you do. How nice that the people there seem so accepting. Your skills in identifying plants is superb ! As an ‘arm-chair’ explorer I so enjoyed these pictures. What stunning orchids….and mountain people! Fantastic…..stumbled across this while looking for a nice Euphorbia for a dark shady place in a London back garden…! What an adventure – spectacular examples of wonderful intriguing mysterious plants leaves people and flowers. Thank you! Came across your blog while on a hunt for fiddlehead ferns for a London garden, and ended up with my imagination all over North East India (I even pulled up some maps). Delightful! I am presently writing a biography of Reginald Farrer, the British horticulturist who explored in China and Burma in 1914-1920, and have just found your inspiring website. I would very much like to use one of your photographs of Schefflera hypoleuca in the book and ask please if that would be OK with you. I would need the image at least as a 1 mgb size for publication. I have not been to this part of the world but have travelled through Gansu and Qinghai botanising and photographing Farrer’s (and William Purdom’s) itineraries. Really fantastic blog , thank you ! Wonderful seeing the landscape and the people , really great journaling and botany, the plants and biodiversity always amazes.! I am from Andra Pradesh and i have very vivid memories of the flora and fauna in the villages and jungle and foraging. Makes me want to get back into ethnobotany . Hello greetings from Hungpung Ukhrul .! !